There was a significant landmark in the growth of 'walking squash' last weekend as 16 participants with a combined age of over 600 took part in the game's inaugural tournament. 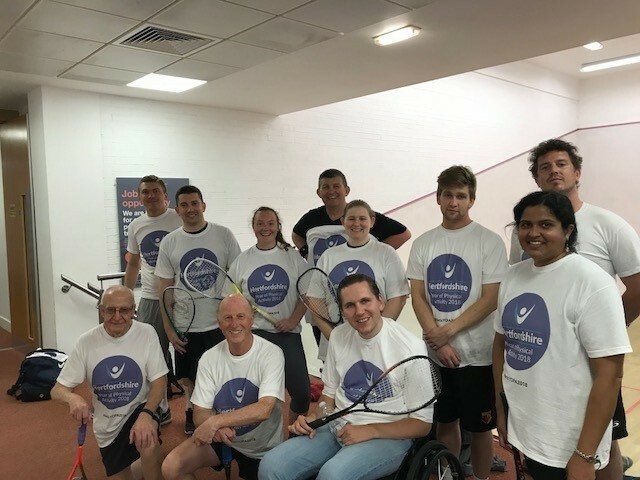 Walking squash (as ConnectSport reported in March) is the brainchild of a group of older players at the University of Hertfordshire Sports Village who had been forced to give up squash due to age and/or injury. Fed up of not being able to play the game he loved, one member of the group, 57-year-old John O'Callaghan, devised a set of modified rules. Using a bouncier red-dot ball, no shot is allowed to bounce in front of the short line (i.e. in the front half of the court) and must bounce in the opponent's back quarter. It's essentially a cross-court length game, which reduces the intense movement and physical impact of using the whole court. Such has been the new format's popularity that 16 players entered its first tournament last weekend (June 9-10), including two septuagenarians, four ladies making their squash debut and a 21-year-old student who was roped in as he walked past the court on his way to the gym! The tournament was organised as part of May Walking Month, which is linked to the Hertfordshire Year of Physical Activity 2018 campaign. The winner was 68-year-old Peter Simmons of Stevenage, with the 'Most Improved Player' award going to University of Hertfordshire employee Maylani Appasamy. Jon Wood picked up the oldest competitor award, donated by tournament sponsors, the Herts Sports and Physical Activity Partnership. O'Callaghan, walking squash inventor and director of the Partnership, lost all six of his matches. He reflected: "It was a great occasion with some exceptional squash action, played under modified rules designed to accommodate those with limited mobility, due to age or injury. "For those of us getting on in years, or with restricted movement due to injury, walking squash is a great way to keep fit and it provides a much-needed release valve for that competitive edge which, in my experience, never leaves you. "I would commend it to anyone that is up for trying something different. This format of the game caters for all ages, sizes, and abilities and the lack of previous experience need not be a barrier to giving it a go."